Representatives for The Notorious B.I.G. 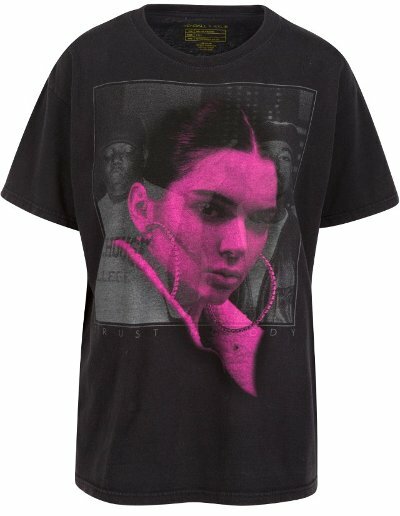 's estate have refused to accept Kendall and Kylie Jenner's apology for using his image on their vintage T-shirts without permission. The reality star siblings were slammed for releasing a line of Vintage Tees under their label Kendall + Kylie, which featured colourful prints of themselves placed over retro pictures of artists including Biggie and late hip-hop star Tupac. After receiving backlash from the public and Notorious B.I.G. 's mother, Voletta Wallace, who branded the girls "disrespectful" and "disgusting" for not reaching out for approval to use the pictures, Kendall, 21, and Kylie, 19, pulled the items on Thursday (June 29) and issued an apology in which they acknowledged, "We will use this as an opportunity to learn from these mistakes and again, we are very sorry." However, it seems this admission isn't enough to settle the dispute as the estate of the Hypnotize rapper, which had already issued a cease and desist letter, has since released a statement hinting it plans to take things further. "While we appreciate that the Jenners have made an apology and pulled the unlawful and unauthorized items, this matter has yet to be resolved," it read. Other artists featuring on the controversial tops include band Metallica, The Doors, whose manager Jeff Jampol also sent a cease and desist letter, and Black Sabbath rocker Ozzy Osbourne. His wife Sharon Osbourne has also hit out at Kendall and Kylie too, taking to Twitter on Thursday evening to share her thoughts. Accompanying a photo of a T-shirt featuring a photo of Ozzy with his arms out, with Kendall's face printed over the top, Sharon wrote, "Girls, you haven’t earned the right to put your face with musical icons. Stick to what you know…lip gloss," referring to Kylie's make-up line.